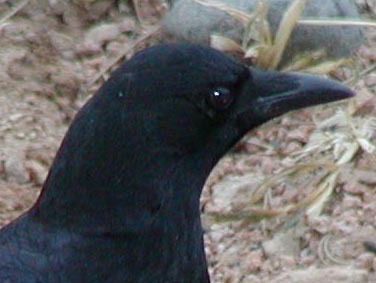 A quick way to tell Ravens from Crows is to notice their bills. Ravens are larger birds and have much larger bills than Crows. 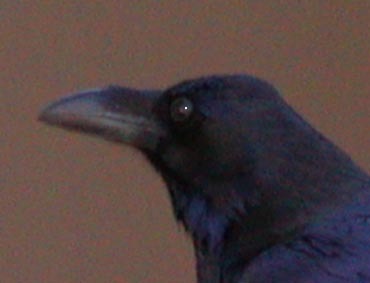 Typically, I see Crows more often in flocks where Ravens are more solitary. When they fly overhead, Crow's tails looked squared off on the end whereas Raven's are rounder and form a fan shape. 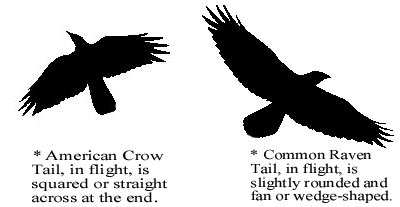 However, as Crows come in to land, they can flair their tails in a fan shape like a Raven's as they use it for a rudder and brake. You also might see several Crows chasing a single Raven on the wing, where you can really see the size difference.